KARACHI: Bilawal Bhutto Zardari, Chairman of Pakistan People’s Party (PPP) gave vent to his emotions about his mother- the first woman to be the prime minister in Islamic world. He said he never found his mother complaining, even in private, about how she was treated only because she was a woman. He criticized General Zia saying he radicalised Pakistan to such an extent that we are still haunted by his actions today adding as a result of his extremist legislative rollbacks Pakistan became the first country on earth to revoke rights already granted to women. Having launched a campaigned against his rule, Benazir faced enduring imprisonment, solitary confinement, exile, assassinations of family members and associates was what she had to live through as a young woman, he added. The young PPP chief remembered 1988 when he said his mother led a nationwide election campaign, wrote a bestselling book, had her first child and became the youngest and first female prime minister of the Muslim world. Bilawal said a public campaign was launched to say Islam did not allow for women to rule and so-called scholars issued fatwas decreeing against her rule. Noting about the time when his mother was pregnant with his sister, Bakhtawar, he said her prime ministership was challenged for that fact with calls for her dismissal. 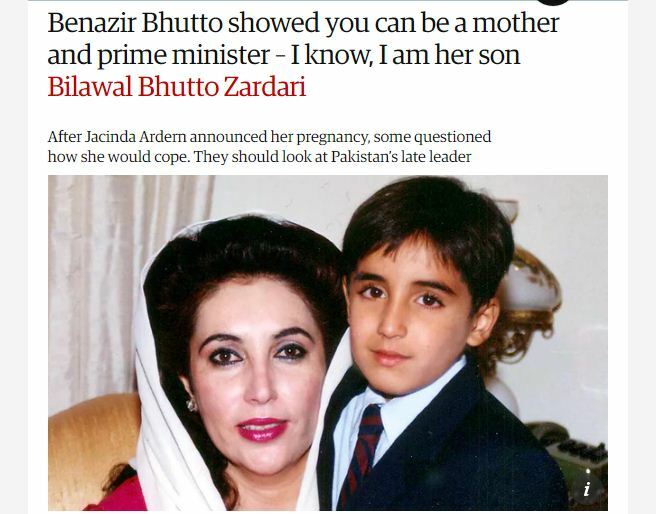 Bilawal said forces of dictatorship and extremism robbed him of his mother but she lives on as a symbol of hope, a role model for women across the world. Concluding his recollections, he said his mother proved women can certainly do everything, adding she lives on in history as a global icon. “I know every child thinks of their mother as superwoman, I certainly did,” he paid tribute to his mother.